View a visualization of the new parking structure from McCarthy Building Companies. Recently, the Los Angeles County Board of Supervisors unanimously approved the budget for a comprehensive parking structure to be added to the Martin Luther King, Jr. Medical Campus. 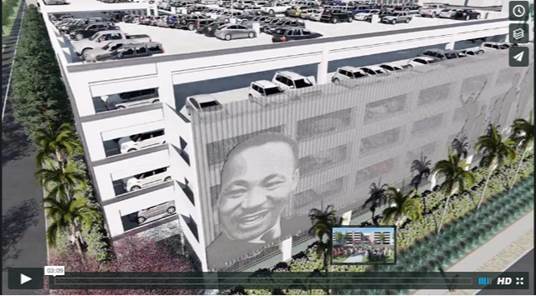 “The parking structure represents the next phase of the County’s effort to reinvent the MLK Medical Campus,” said Los Angeles County Supervisor Mark Ridley-Thomas. The new parking structure will include six levels and 1,400 parking spaces to respond to the current parking challenges on campus. The plan includes an entry roadway to the campus, reconfiguration of Wilmington Avenue adjacent to the site, construction of the parking structure, and civic art. The build also includes a program to promote the hiring of local construction workers. “The proposed MLK Parking Structure is a good investment and reaffirms the County’s commitment to build a first-class wellness campus to serve the larger community,” the Supervisor said.